Again I break a vow not to post sermons on this blog. But I had wanted to share some of my reflections from the Bishop Formation Event I attended last week and, since I did so in the following sermon, I decided this was the best way to share them. I have made some edits to my original manuscript, otherwise it would have been burdensomely long. Enjoy! 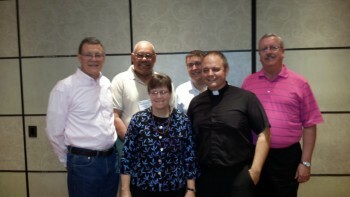 There were five of us who had been elected bishops for the first time – babies, in other words – and one who had been bishop in another synod, but now had been elected bishop once again somewhere else. We kiddingly named him Nicodemus, because he had been born again. The purpose of this five-day experience was to give us some guidance into what we were getting ourselves into. Believe me, the amount of information we received over this time can be compared to drinking from a fire hose. It was long, tiring, exhausting, and overwhelming. But the one great assurance we received during this time was that all the other bishops, as well as those people on staff at the churchwide offices, were ready to help us in any way they could. The one thing that every single person there stressed to us was that if we ever had any questions, we were free to call them at any time. I collected a lot of cell phone numbers – a couple of them we were told to have on speed dial. That’s how willing they are to help us. “When in doubt, call!” became the mantra for the week. I had my life pretty well planned out, at least for the next couple of years. But God had other plans for me, apparently. One of the first things we did as a group was sit around a table and tell our stories. We began at the most logical point for all of us – at baptism. When were we baptized? How has our baptism informed our life and ministry? How were we involved in ministry before we were ordained? What did all that mean for us? And the one thing about this exercise that left an impression on me was that all of us, all six of us, had more in common than I would have ever imagined. We were all filled with the same doubts, the same apprehensions, the same questions, and very similar experiences. Some of us had deep roots in the church, some of us had come to the church a little later in our earthly journey. Some of us were pastor’s kids, others had been part of an unchurched family. I give you this long and overly detailed introduction to tell you this: that when God chooses you and Jesus calls you to fulfill God’s mission, who you are makes no difference. 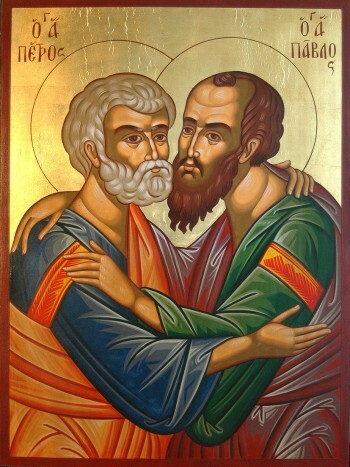 We see that very vividly in the lives of Peter and Paul, whom the church commemorates today. When you learn a little more about the lives of these two men, you are left thinking that Jesus sure made some curious choices. But I stand before you today as flesh and blood proof that not only was God making some curious choices back in biblical days. God in Jesus Christ is still making curious choices today! This is not just something that happened a long time ago – it is still happening even now! By human standards, if we were to pick someone – anyone – to lead the church today, it certainly wouldn’t have been either of these two men. You’ve heard the stories of Peter and Paul often, but let’s hear them one more time and ask ourselves why Jesus would choose these two in particular to lead his church. I promise I will try not to make this sound like a history lesson. First, let’s talk about Peter. We love to pick on Peter. He is such an easy example to lift up because he had the capacity to do wonderful things, and turn around and do the most wonderfully stupid things. He talked a good game at times, but when it came time to deliver, Peter was often nowhere to be found. He’s usually noted as the disciple who repeatedly put his foot in his mouth. And I would imagine he’s taken more criticism from the pulpit down through the centuries than any of the other disciples. Peter was the first to recognize Jesus as the Messiah, the son of God. But he turned around and when Jesus was arrested, just before he was crucified, Peter – yes, that Peter – denied Jesus not once, but THREE times! Note that after the third time Jesus asks the question, our text tells us that Peter felt hurt. But we don’t hear Peter’s reaction when Jesus tells him what kind of death he was to die. He was told he would die a martyr and this time Peter didn’t protest to the Lord that it certainly would not happen the way it had back when the rooster crowed. One thing we know about Peter is that after Pentecost, filled with the Holy Spirit, Peter gave one of the greatest and most powerful sermons ever preached. We just heard the story three weeks ago. As a result of Peter’s sermon – and I can’t help but say again, yes, that Peter! – three thousand people came to believe in Jesus that day. Imagine that! Three thousand people believed because of the words of this one time coward who denied the very man about whom he was preaching. When Jesus told Peter that the day would come when others would lead him where he did not wish to go he was telling him that in order to follow him he must give up those very things that made him who he was. God created Peter with a unique personality that was good. But in the end he would have to lay it down. God would fill Peter’s life from that point on and use it to build up God’s kingdom. Then there is Paul. Formerly known as Saul. We recall that Saul persecuted and even killed Christians. He was present at the stoning of Stephen. Let me read to you the words from the book of Acts just to show you what a ruthless man Saul was before he received His call from on high. Hear the word of God according to Acts, chapter 8, just after the stoning of Stephen. So Saul sees the Lord in the blinding light that darkened his eyes but enlightened his soul. God uses all of Saul’s life, both the positive and the negative, to build him into the person he needed him to be. God took Saul, all he was, even the passion he had against Christians, God took all Saul was, reversed his direction and then made him into the man God wanted him to be. 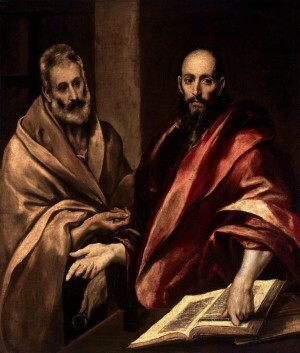 Together, Peter and Paul became the two greatest apostles known to the Christian church. Together with the whole Christian Church on earth, we give thanks to God for Peter and Paul. So what are we to take away from all this? Well, I’m glad you asked. On this day when we celebrate these two pillars of the church, we are reminded first of all that God takes all of your life experience, thing events you are proud of and the things you hope no one will ever find out about, God takes everything in from your life, then reverses your direction and then uses everything that happens in your life to make you into the woman or man God wants you to be. Don’t be ashamed of your background, or where you come from. Embrace it. You are who you are, very, very, specifically, so God can use you in His particular circumstance. All that has been in your life has molded you into who you are – and God takes advantage of your past. The good, the bad, and the ugly. For us, it is hard to see how impossible it was for a man like Saul, to become a man like Paul. We read his powerful words and think that Saul was something other than the rest of us. But that is not true, Saul allowed himself to be used by God, and God in His turn took all that Saul was and great thing happened for the kingdom of God. For anyone who was alive in Peter and Paul’s day, these two were perhaps the LAST persons who they would have thought would make a great impact for the Gospel of Jesus Christ. They took a look at their backgrounds, they took a look at who they were and concluded that Paul and Peter were polar opposites of the types of people Jesus would want to serve him. But they were wrong. One thing that counselors and therapists will tell you is not to allow yourself to be imprisoned by your past. Don’t allow others to determine your future. Jesus Christ has the power to forgive your transgressions and prepare you to become an instrument for God’s purpose. In spite of this apparent tension, however, we see today within this feast an example of how we are to live with each other in the Church. Certainly, as people from all walks of life, we will have differences. We are all different people with different needs. However, today’s feast shows us that the Church is first and foremost a place where God’s love reigns (as the Lord said, the world will know us by the love we have one for another.) It is this love from God that enables us to overcome both our personal and interpersonal difficulties and it is this love that reminds us that with God all things are possible, and therefore, when Christ commands us to “love our enemies” it is with the full knowledge that it is His love and grace that will empower us to do so. God doesn’t ask us to “like” our neighbors and enemies, He commands us to “love” our neighbors and our enemies, a task which is far greater and is not predicated on how we feel. But it is a choice: it is a conscious decision on our part to will the highest good for everyone we come into contact with. Love is therefore a choice. It is how we choose to act/respond. And lastly, our third takeaway is that the readings today emphasize the presence of God in the work of his Church. Through the centuries, the Church has been battered and countless efforts made to wipe it out but it continues to benefit from Christ’s promise. Once in the grip of grace, Peter and Paul accomplished God’s purposes. That doesn’t mean that they didn’t suffer. They were jailed, shipwrecked, beaten and finally killed. But not before they made Christ known to thousands of people. For you and me, it is the same. As we learn from our readings today, and all of Scripture for that matter. There is nothing that God in Christ Jesus cannot do with us, once we are filled with the Holy Spirit. Peter and Paul became great in the kingdom of God, because of Jesus, and we become great in the kingdom of God for the same reason, no matter who we are. May it also be so for you. Thank you for sharing this sermon with us, Bishop-elect Allende, fellow Trinity grad. Thank you, Sandy, for reading it. Blessings to you!